Is keeping the horse you love a struggle? 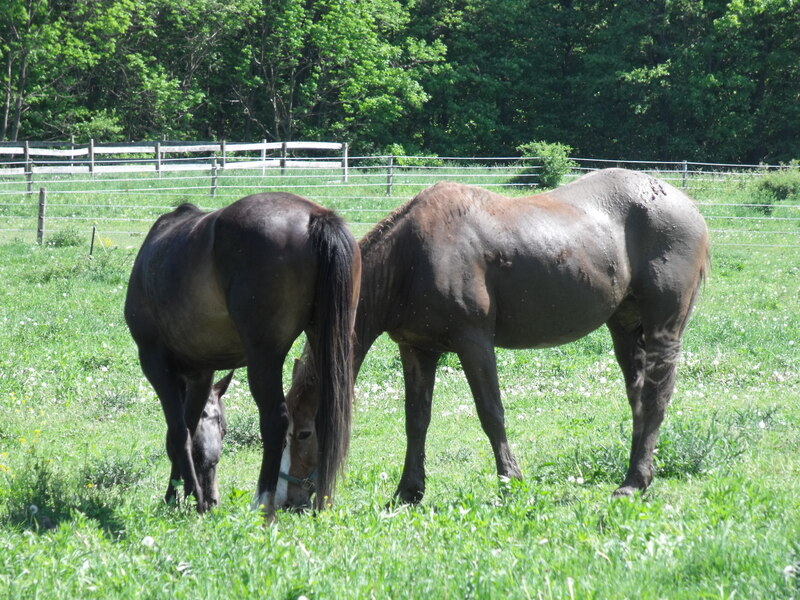 It can be heartbreaking to look at a horse you envisioned as a family member, companion and partner for life as an expense you can no longer afford. ‘Buyer’s market’ is a mantra we’ve been hearing in the equine industry for too many years. When that translates to needing to find a new home for a trusted friend that’s been your spiritual rock, recreation and health club combined, there’s more to consider than the money of the matter. Fortunately, if you’re willing to be creative, you can find solutions that may allow you to keep your trusted steed healthy, happy and home or at least ensure his life without you in it will be a good one. Not to get into a political discussion here, but what’s scarier is the transfer payments (basically monies allocated through taxes that are given to citizens to pay for housing, food, clothing, health care and transportation). In 1929, the percentage was .05 percent. When Medicare began (1965) it grew to 11 percent. Now, it’s close to 35%. Of course, it doesn’t take a genius to extrapolate that a growing number of people in this country are depending on others to pay their way. For whatever reason this is happening, with so many unable to even care for themselves, it’s no wonder more are labeling horses a luxury they can’t afford. But horses aren’t just recreational vehicles to be sold off as commodities when times are tough. They’re pets and partners representing ‘me time,’ emotional bonds, spiritual enrichment, psychological stabilizers and confidants. Before you decide you can’t afford a horse anymore, consider the real costs – and try to get creative about how you may be able to hold on. What you’ll do to replace the mind calming components of your horse relationship (or the toll of not having an equivalent outlet)? 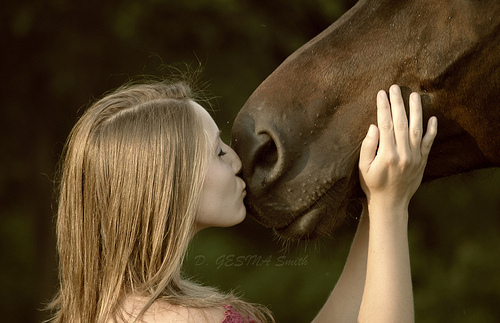 Do you have another source for the affection and connection that comes from your horse? How will you replace the physical fitness and connection to nature components of your horse time? Will saying goodbye to your horse rob you of the only personal time you have? Are you ready to deal with the stress of wondering where your horse lands during his life and how he’s doing? If you’re firm about selling, save yourself the misery of looking up the horse later unless you have a buy-back agreement. 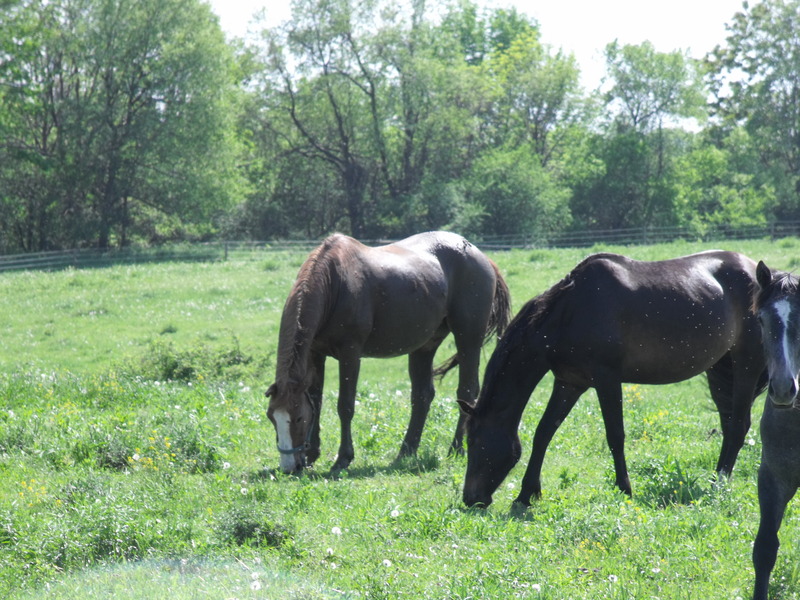 Fortunately, there are a lot of ways you can reduce, share or cover the costs of owning a horse. The possibilities are as vast as the ideas you can entertain. It’s not necessary to sacrifice if you’re willing to work a little more or make concessions that allow you to continue to spend time with your horse for less. Saying goodbye is heartbreaking. It’s not always necessary. Photo courtesy of Tricia Hope via Flickr. Before you cast off your horse with the conviction he’s costing you too much, consider what you’ll lose when he’s gone. Money isn’t the only factor in the equation. If he’s not the right horse for you – or you’re not the right person for him – that’s a different story. But, if you have a horse that’s been your partner, your biggest enjoyment in life, your only exercise and/or your rock, the price of losing this lifeblood is a lot higher than the savings you’ll see by eliminating what you’re shelling out to keep him. If he’s really important in your life, take the time to get creative with answers to keep you both happy. Sometimes selfish is good. Have you ever sold a horse and continue to regret the decision? 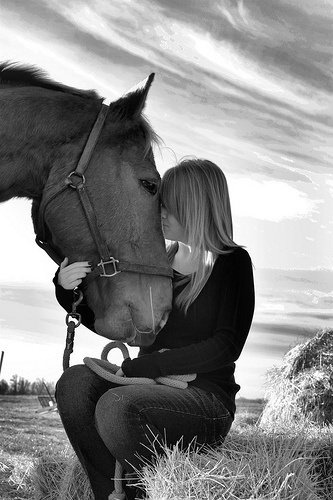 Are you challenged right now with an equine you feel you can’t afford to keep? Please share in the comments below. You’ll certainly get some kindred souls sharing your pain and might even find the ideal answer to your challenge from blog readers. Everyone involved in creating the Inventing Your Horse Career initiative had a lot of fun with this project. It was amazing to hear the stories and histories of some of the people shaping the equine industry in the United States and Canada while fascinating to learn from their experience. Linda Hauck struck me as a great success story when I first met her – and a perfect person to spotlight for those who dream of a job with horses in the mix but aren’t sure how to make it so. Her story of inventing the Spursauder comes from personal challenge and a determination to find a better way. What’s amazing about her accomplishment is she managed to go from prototype to international player in less than two years. With an initial frustration about how traditional spurs didn’t work well with the off-the-track Thoroughbreds she was training and the imagination to create a better solution, she now can be proud as people spot FEI competitors doning her product. In just months after final design, Linda secured a distributor with a long history and huge reach in Europe. Six months after that, she was signed on the spot with an Australian distributor with 40 stores. Today, she travels the world, picking up distributors and fans in new countries every month. This product was invented in 2009. What fun for her – and anyone who’s able to model her approach to achieve similar success! Once she rolled out the prototype and confirmed on the horses she was riding it did what she intended this spur to do (provide a softer solution for more sensitive horses), she put it in the hands of as many professional riders and trainers she could ‘spursuade’ to give it a try. Her goal was to get honest feedback prior to crafting a final product design. Of course, having the testimonials of Olympic medalists helped as she moved through manufacturing to building strategies for packaging, marketing and distribution. Trade shows have been a perfect vehicle for her to sell this product (to both individuals and distributors), but she cites a close second as getting people to test it on their own horse. She still gives away a lot of product to tack shops (one free with every eight display purchase – recommending the store owner sign out the freebie to shoppers to test), reviewers, professional riders and others in a position to help spread the word. “If someone had said to me a year ago, Linda, you’re going to go to Australia, England, Germany, British Columbia, Alberta, across the United States because of this spur, I would have – no, you’re crazy,” Hauck admits. It’s remarkable how fervor behind the right idea can take off. What Linda’s managed to do is present her product in a way that crosses all industry disciplines to appeal to trail riders, extreme cowboys, dressage riders, eventers, hunters and those that just want to have fun. Visuals are critical at trade shows. This includes making your booth look good with color coordination and banners hung high so people can see them from a distance. Linda notes the importance of having good product displays and interactive opportunities for visitors. In her case, this involves spotlighting both Spursauders® and Prince of Whales spurs and conversations that have people poking each other with both. Frequently, early visitors return with friends to exchange jabs and feel the difference. Linda admits advertising and pictures don’t work for this product because it’s something people need to feel and see in 3D. Understanding how people will best experience your message is part of creating a good marketing mix, and one that Linda’s discovered through trial and error. As with all of our Contributors to the Inventing Your Horse Career series, Linda has a strong focus on believing in what she’s doing with a giving back mentality. That’s been a big factor in her success. “If you’re not sold on your product, they’re going to know it in a heartbeat – believe in your product and you,” she advises. 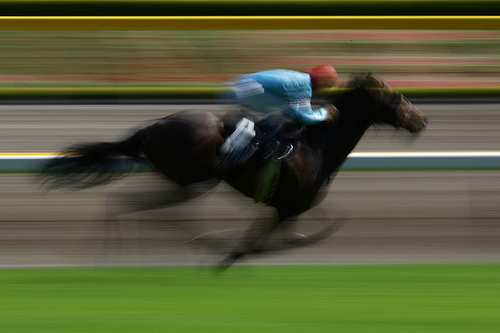 If you’ve always dreamed about a career with horses in the mix, why not try? Of course, it will require time, dedication, research and the right idea, but if you’re willing to do the homework, weather the challenges and get excited about the opportunities, you might be surprised at how possible turning your passion into a livelihood is. It’s critical to ensure you have a market. We interviewed a number of people who were offering something new so had little to compare their offering to, but designed a great plan to educate (and in some cases, production required a lot of creative thinking too) those who might be receptive to their idea. Plan on two years before your business takes off (and don’t get frustrated when you feel like you’re putting a lot of effort forth with no returns – early marketing, networking and outreach tend to pay huge dividends just about when you’re ready to give up). Work the numbers (keep your other job during start-up efforts), put a marketing plan to paper and seek out mentors to help you get and stay on track (the horse community is incredibly accessible and kind when approached with clear and concise requests). Find out from those who have succeeded before you what you need to learn, who you need to know, how you need to proceed and what to look out for. If you’re serious, dedicated, passionate and willing to put the research and learning time into preparing for a smart start, you might be amazed at what you can do. It’s always interesting to witness herd dynamics. 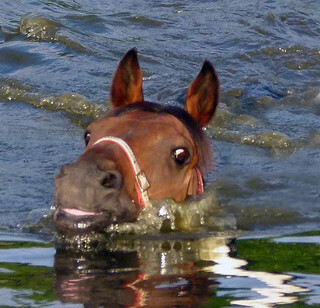 Just when you think you have the players and likely responses figured out, horses surprise you. Grania has been here a couple of years (since her second arrival at Halcyon Acres®) and even though she’s now a farm-owned horse for all practical purposes (her owner died and the surviving husband has put decisions regarding her care in our hands), she hasn’t joined the herd – until now. For a long time she was a client horse here to be transitioned as a future stroke recovery therapy horse. 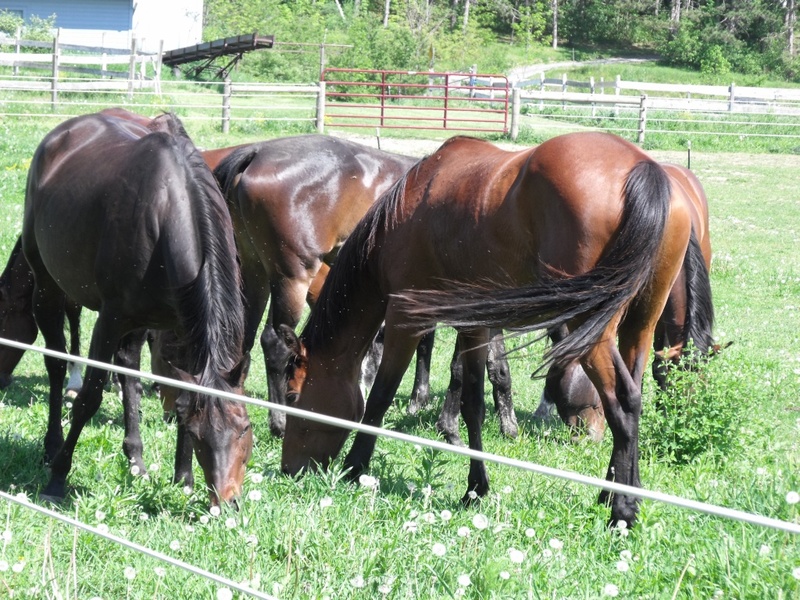 Sometimes there’s a good reason to add a transient to the mix, but usually it’s not worth the angst for the herd – nor me – to introduce a temporary resident to the home gang. Judie, the client, a friend, New Mexico resident and determined survivor was getting mobility back from the stroke when she succumbed to cancer. One of her last wishes was that we ensure Grania was provided with a happy home for life. As an aside, we know ultimately it’s not here (Grania loves to train and there’s just not time to give her the kind of attention she relishes). Grania tried some initial posturing when introduced to the herd. She's the one with the wide blaze in the background snaking her head. Recently, company became important to this previously independent loner. In the past, we found companions (victims) to put her with, but she usually responded with unwarranted aggression until they retreated to an area far away from her space and path. Putting such a mare with the curious and social farm herd crew could be dangerous. Interestingly, Grania took a liking a to a docile TB mare that came in here for starting under saddle lessons, and later, winter conditioning training. For the first time since she’s been here, Grania allowed a horse to graze alongside her and even nickered when she left and returned from riding time. Grania’s buddy trucked out this month. 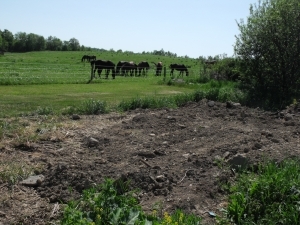 Suddenly, Grania developed a desire to be near the other horses on the property. After she jumped a fence then thundered toward the big pastures (I stepped out of the way as it became clear she had one thing on her mind and halting at my feet wasn’t it), it was clear her loner tendencies had changed and so must an approach to keep her happy. Over the years I’ve met some horses (they’re rare) that don’t like other horses. You may recall Lulu from prior blog posts. She’s home now and happily segregated into her own private pasture. 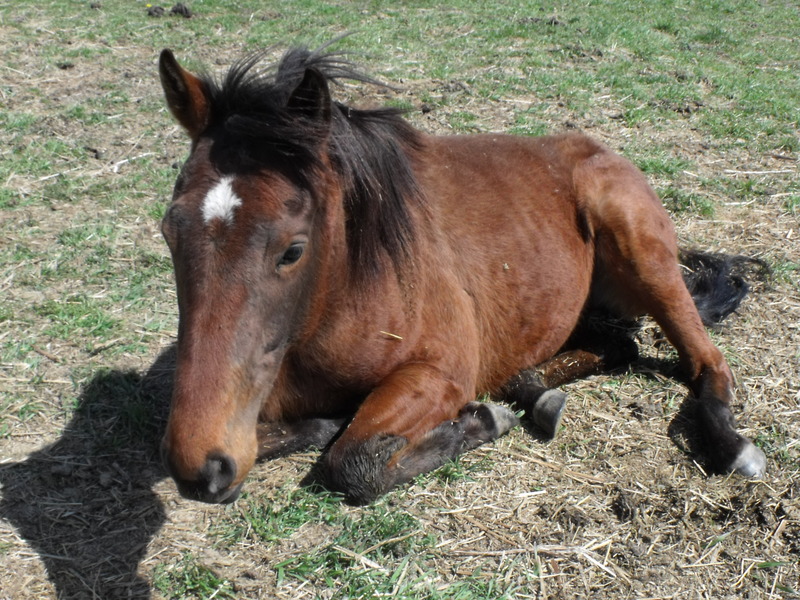 We tried all sorts of company arrangements and tactics to help this filly learn to appreciate equine companionship. It just wasn’t in her wiring, nor a case of prior trauma. She simply doesn’t like other horses. Porky, my best ever farm hand, was another. 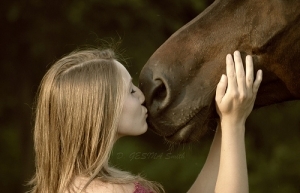 She’d get along fine with everyone, but preferred human companionship to horse company. The more horses that came to the property, the less she liked it. In fact, she was happiest when she was the only horse here. Grania, though, is the first I’ve ever seen go from happy loner to herd attached. Crooked is the photo bomber in the foreground. She was facinated with the new introduction to the herd and the only one besides Leah and Judie who demonstrated a fearless desire to be friends. Part of the reason we delayed culling a companion from the farm herd is because it looked like Grania would be changing homes to take care of a kid through the Pony Club ranks. She liked this gal and was an ideal fit with her joy of jumping, some exquisite foundation dressage training and an ability to handily adjust to the level of the rider aboard. That fell through and it was time to make a decision about how to handle her new desire to be social. Since we’re getting ready to start rotational grazing, it didn’t make a lot of sense to allocate an entire pasture to a single horse or pair. In fact, it would have required two (six acres) to make water delivery easy and shelter readily available with the current configuration. So we decided to take a shot at introducing her to the herd. Judie and Grania are in the background - far away from the rest of the closely gathered herd. Redford's resting place is in the foreground. Still not sure what to do with the spot. We picked Cowboy for Grania’s initial single companion. 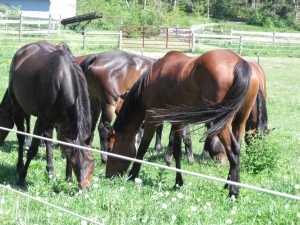 The two shared a couple of pastures adjacent to the herd with access to the other horses over the entire fence length. This 8 YO TB gelding is one of the most amiable in the herd, big (16.2hh) and unflappable enough not to be bothered by her possible aggressive behavior. He also didn’t seem to have any strong peer attachments. Bad decision. The first three hours were uneventful. In fact, the pair didn’t even go through any squealing or striking rituals, but instead, merely planted their heads in the grass next to each other and grazed without much notice of each other. Of course, everyone in the herd ran over to the fence line to investigate the new scene and gathered like soldiers in formation (wish I had a picture of this one), but ultimately went back to routine. I was working in the vegetable garden when the sound of pounding hoofs caught my attention from more than a half mile away. The sight was horrifying. Cowboy, neck out-stretched, teeth bared and hoofs chasing at 30 mph went into an attack-mode frenzy (I’ve never seen this kind of behavior from him – and he was born on the farm) aiming for the jugular. I’m not entirely clear what set him off (didn’t see the engagement moment), but suspect he was reacting to a separation from Leah. She was running the fence line with the pair. I bolted out to the pastures, opened the gate, Leah entered and Cowboy exited. That actually worked out better than I had envisioned because Leah was my second choice. She gained alpha status in the herd (we have several with this designation) because she refused to move when the most aggressive mare in the herd (she’s so not an alpha) tried to chase her out of the run-ins or away from water. She’s a leader that’s been appointed even though she’s never shown any aggression toward others in the herd. She’s only three. Leah was great about being kind and accepting in her requested role as Grania’s baby sitter and short-term friend for herd introductions. I had promised Leah a single day of separation, but it wound up being two because Cowboy’s continued aggressive behavior over the fence line was a concern. After the Cowboy incident, I was anxious when the time came for herd introductions, but fortunately, it was basically a non-event. Crooked (a fearless yearling filly) was most curious about this new herd sight (she’d been with the same crew since a couple of weeks after birth) and spent time touching noses with Grania for hours. Leah helped keep her safe (what a gem this filly is) guiding her away from herd infractions likely to result in a beating. Grania did err as she tried to command one of the run in sheds as her own (she learned that lesson quickly and exited at a gallop), but didn’t make that mistake again. Judie apparently figured the best way to show friendship intent was to introduce Grania to the only tiny mud hole available in this 26-acre pasture. It was amazing to witness Judie's willingness to offer herself as a fast friend to keep Grania safe. Interestingly, Judie (yes, her nickname was given to honor Grania’s former owner while she was still alive – her registered IDSH name is Halcyon’s Keepsake – karma or what?) decided to be Grania’s buddy and secluded herself from the rest of the herd to provide companionship and guidance. Maybe it was a good thing Cowboy went into stallion attack mode. It seemed to humble this mare that was previously an unrelenting aggressor. As I picked up my head from garden activity to see what all the noise was about, even at the distance, it was clear Grania felt she was running for her life. She probably was. Teeth marks (fortunately all superficial) were apparent along her jugular. She did get in some good kicks (mostly on Cowboy’s chest – all superficial but well-aimed). Curiously (or maybe not – this is an incredible filly) Leah jumped in as the kind companion and artful leader she is with all. While she wasn’t initially thrilled about being separated from the herd, she seemed to quickly understand she had a job to do and managed to help Grania easily transition with wise and watchful counsel. She even stepped in to put herself between Grania and Cowboy when he became threatening with body language. Leah’s only 15.1hh and dwarfed by Grania’s bulk and Cowboy’s height. I continue to be amazed at how intuitive horses are. Whether they’re picking up signals from me or jumping in to ensure a safe and peaceful living arrangement, I don’t know, but it sure is neat to witness. This past month has been heart-wrenching. Days have been marred with a constant struggle treating symptoms without a known cause to try to help dear, sweet Redford recover. This takes its toll – on both you and the horse. The time and angst involved in playing the guessing the game without uncovering an answer can be all-consuming – and devastating. Redford, a 14.2hh, three-year-old Thoroughbred gelding has served as my buddy, a source of inspiration and on-the-ready helper for so many different farm tasks. He began this ordeal with what is commonly called colitis, but can mean just about anything once you get past the outward signs and discover what’s really going on inside. Sadly, in many cases, this isn’t discovered until after a necropsy (or autopsy) is performed. Redford’s always been one of these really special horses with personality, an intuitive cooperative spirit and a helpful cleverness that makes you smile. Everyone introduced to this horse wants to bring him home. He’s just always been a character with a kind, gentle approach that’s tuned in to whatever the person he encounters needs to feel comfortable. It amazed me to watch what I came to regard as ‘my little helper’ in action. 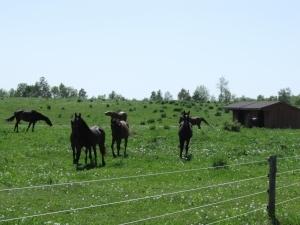 We have a group of farm-owned horses at Halcyon Acres® that spend most of their time on about 26 acres of pasture spattered with run-in sheds where hay and minerals are provided as necessary. 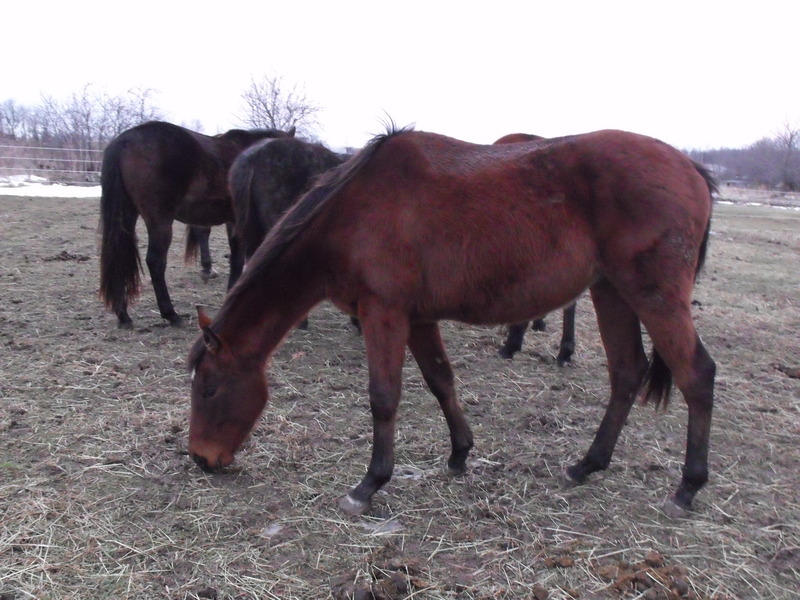 During much of the year, about half the horses get culled out daily to go into the barn for grain and/or treatment or training. We keep a routine, and that helps, but Redford somehow figured out how to jump in with influence to save me tons of time while adding a huge grin to my face. What struck me as so odd about all this is Redford certainly isn’t a herd leader. In fact, he ranks pretty much at the bottom of the hierarchy. Yet, I discovered if I called his name first when it was time to bring horses into the barn, he’d take notice immediately and start heading toward the gate. As I called others’ names he’d check to see if they were following. If not, he’d go round the ones indicated up one at a time as names were called and head them toward the barn. Every horse he approached would then fall in line and head down the hill as instructed. He only culled out those called. When Ferris Hills came out for the first time (they do this annually now), we called on Redford to make the trip more fun knowing he’d stay safe. All other horses are behind a fence. Redford was a yearling colt (in-tact) at the time (he’s the one saying hello to those still on the bus). One in the group was the lead mare and I couldn’t trust her to take the herd to the barn unfettered as she would occasionally delight in heading everyone off to the corn field. My first approach was to halter her prior to opening the gate, but this need stopped when Redford became the guide. All I’d have to do is open the gate and ask Redford to ‘take them to the barn’ if Midge decided she was going to pull one of her excursion exploits, and he’d get back on track down the hill with other horses taking notice and following. He’d go with the herd initially and naturally, but the moment I requested his assistance, he’d jump in to fill the role. 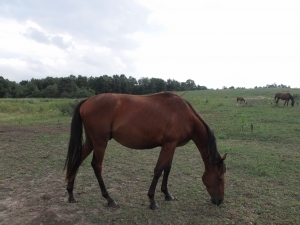 We started treatment with stall restriction but soon it became apparent he needed grass. For a week or so, he was confined to small paddocks for limited time to ensure the exposure didn’t lead to a laminitis issue. After that, he couldn’t be turned out with the farm herd because it was important to limit his exertion and this crew can get pretty vicious with a sick horse that’s been out of the mix for a time. The paddocks didn’t offer shelter or safe socialization opportunities. So I decided to turn him loose, ultimately for about twelve hours a day (on those days when I was at the farm continuously). Redford, in true fashion, appreciated the privilege and kept me smiling with his wise and accommodating approach to this offering. 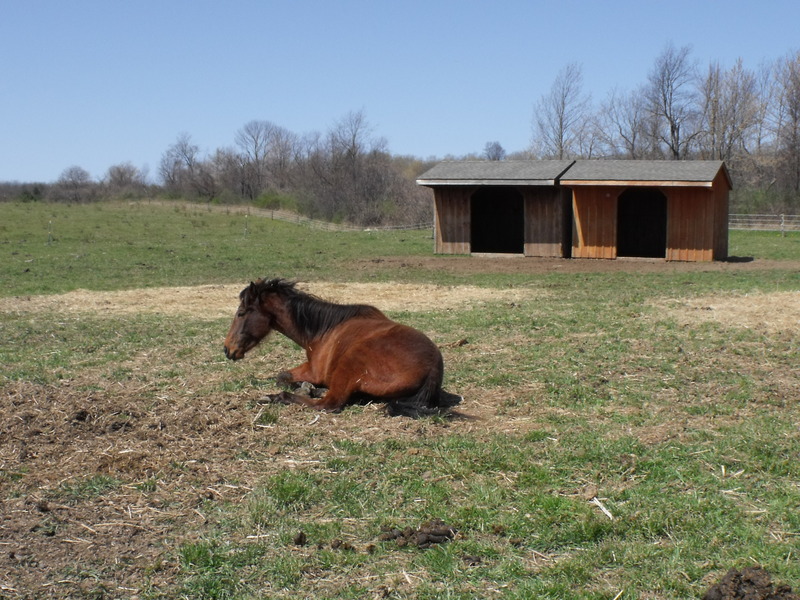 He’d graze along the fence line to be close to the other horses when they were near the barn, travel down the cherry laneway, nap in the tree line or in his stall and return to the barn when he wanted shelter from the wind, bugs, rain or sun. Sometimes he’d sample hay from the stack, but never made a mess, nor did he get into the grain (besides the complete feed bag set out for him). He developed a routine that usually had him grazing all morning and late afternoon, hanging out in the barn in the early afternoon and returning to his stall in the evening just before last chores to be closed in for the night. My plan was to interact with Redford at liberty for everything we did to prepare him for a riding career. He was going to be the first horse I started without any tack. I imagined the two of us riding out sans bridle and saddle tackling whatever challenge appeared with an understanding and connection that didn’t require restrictions, but was instead, drawn from a trusting and intuitive connection that had us both in sync in uncanny ways. We were already there on the ground so it wasn’t a stretch to see this during riding time. Something wasn’t quite right with Redford on April 15, 2012. We later learned things were very wrong. Redford was born on my birthday three years ago. He died yesterday. In Redford’s case, we did all the tests – blood work, fecals, belly tap, etc., etc., etc. There wasn’t anything that came back indicating an issue. When we opened him up we discovered cancer. He spent the last month of his life spewing liquid manure, sporting a high temperature we often had trouble controlling, tolerating needles, dosing syringes, thermometers, baths to prevent scalding on his backside (he hated these but stood like a trouper when asked), losing tons of weight and demonstrating a positive and resilient attitude in the face of pain far greater than we realized. On Tuesday, he gave me ‘that look.’ I listened. I’m going to miss this little guy so much. Every day he enriched my life. It’s sad we weren’t able to save his. I get things happen for a reason, but I haven’t yet figured out what I’m supposed to take away from all this. In fact, there are going to be a lot of tomorrows that will seem empty without him. Maybe the lesson comes from the extreme kindness and generosity that poured forth through the horse community as we struggled to find an answer that provided a cure – or at least some relief for Redford. There were many, but I should make special note of Kay Aubrey-Chimene (in Arizona), Karen Miller (a referral from Lisa Derby Oden in New Hampshire – I didn’t know Karen prior to this challenge) and of course, my wonderful vet, Dr. Janet Wilson (in New York). It’s comforting to see time and again how genuine and truly caring the people in our industry are. Thanks to everyone for the outpouring of support through this ordeal. Each of you helped to make a very tough month a little easier for both Redford and me. We were fortunate to have Denny Emerson participate in the premiere CD series of the Inventing Your Horse Career initiative. 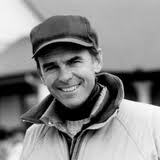 He’s the only rider to have ever won both the gold medal in eventing and the Tevis Cup buckle in endurance. 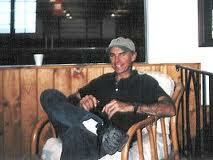 In 2006, he was inducted into the USEA Hall of Fame. Last year his book How Good Riders Get Good: Daily Choices That Lead to Success in Any Equestrian Sport was published by Trafalgar Square. 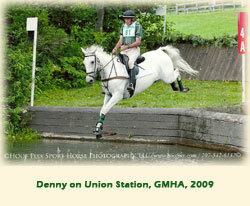 Talk about a lifetime of achievements, Denny has even spent a total of fifty consecutive years competing at the preliminary level or higher in eventing. He and his wife May divide time between their Vermont and North Carolina facilities running Tamarack Hill Farm with a considerable focus on helping young and novice riders enjoy the eventing experience. If you want to meet Denny in person, he’ll be at Everything Equinein Essex Junction Vermont this weekend, presenting on Sunday, April 29th in the Outside Arena from 1:30 – 2:45 p.m.
How has riding changed since you were a kid riding your pony, Paint? “I think in some ways it’s become much more sophisticated and much more polished. In other ways it’s become much more stylized and less adventurous. When I started riding — we moved to Greenfield, MA, from Exeter, NH, when I was nine in 1950 — there were 150 million people in the United States. A year ago, or something like that, we hit 300 million. The population of the United States has doubled in my riding lifetime. With that, the riding opportunities to ride out have dwindled dramatically. I think, unless you live in the big middle section of the United States where there’s still probably more open land, if you live on the East coast or the West coast, where I think a lot of the people who ride English do live, they’ve seen suburbs and shopping malls and highways cut up a lot of the land where, when I was a kid, you could ride. What people who have shaped your riding career and direction? “When I was a little kid, the farm manager at Stoneleigh-Prospect Hill School — it was called Stoneleigh-Prospect then, later it merged with Mary Burnham School, it’s now Stoneleigh-Burnham School – was a dairy farmer from Heath, Massachusetts, named Francis Kinsman. Francis liked kids and he bought a little one horse, open-topped, home-made, wooden trailer to take me around to all the little local gymkhanas. My parents weren’t horse people. Francis opened a lot of doors for me just by making it possible for me to start to do stuff. He was very influential. I didn’t even realize it at the time. He opened doors by taking me to all the little western Massachusetts gymkhanas – Rowe, Heath, Charlemont – all up in the Mohawk Trail area. Later I worked at the Green Mountain Stock Farm up in Randolph, VT, doing Morgans in 1960, ’61. The people that ran that, Jack and Art Titus, were very helpful to me. “Then, when I got interested in eventing — I went to see an event in 1961, I’d never even heard of eventing and I decided I wanted to do that – I was at Dartmouth College and Joe McLaughlin at Hitching Post Farm was very, very helpful to me. I used to go over there from Dartmouth and ride. He’d put me on everything that was available. I started to learn to jump with Joe; I was twenty at this point. I hadn’t been in a jumping background. I’d done a lot of trail riding and showing Morgans and hundred mile adventures at GMHA, that type of thing, but I hadn’t been a jumping rider. I would say those people early on. Is there a particular horse that stands out in your career? 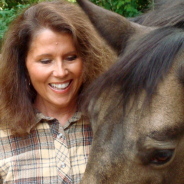 Lisa Derby Oden (the co-creator of the Inventing Your Horse Career CD series and equine business consultant will also be presenting at EVERYTHING EQUINE EXPO on April 29th. Enjoy her wisdom at Learn From the Pros: Unique Career Paths to Success in the Horse Industry in the Equine Summit Room from 12-12:45 p.m.; and Websites & Social Media & Blogs…OH MY! Integrating Your Online Presence from 2 – 2:45 p.m..
Mary Ann Simonds is an incredible woman who managed to merge her uncanny connection with horses with scholarly scientific pursuits long before any 4-year college or graduate studies programs offered an equine focus (she invented her degree focus just about every time she earned a new one). She’s an inspiring, delightful and internationally celebrated contributor to the Inventing Your Horse Career series who understands equine industry issues more than most. Her story is fascinating – as are her lauded accomplishments. Learn more about what she’s doing today at her website. As a forerunner in almost everything she’s done in her horse career, it’s not surprising that Mary Ann was learning about mustangs in the wild – and studying how to best transition those culled out for a domesticated life – long before the current outcry over BML practices started. Much of her life (among many other equine advocacy activities) has included trying to help these horses and the people who adopt them. 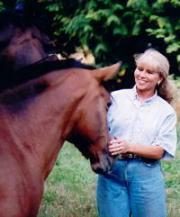 Below are excerpts from our Inventing Your Horse Career CD with Mary Ann. “Well, forty years ago when I went off, I started actually at the University of California at Irvine, because it was a much more prestigious school and I thought, ‘Well, they’ll let me study wildlife biology there and I’ll pick horses.’ But that took me down the wrong path because the first class in the desert was a wildlife ecology class and they had us kill all the rattlesnakes. I quickly realized if you kill all the rattlesnakes, you’re not really studying the ecology of the desert. So, that made me mad. I wouldn’t sleep in the cabin with the professors and the class and vowed that I was going to sleep out with the rattlesnakes, which I did, and had them under my sleeping bag that night. That again was one of those ‘Ahas’ that I realized the next morning when I hiked up out of my bag very quietly and I hiked up to the top of the rocks and almost stepped on a rattlesnake. It jumped up and like a wheel rolled down. I was in tears, crying that there was so much misunderstanding and hate toward nature, and fear. I vowed then that I was going to live with nature and understand what is causing this fear in humans. “I really, truly thought that my study and work with wild horses would preserve wild horse culture and horse culture in general back then. It has been nothing but a continual, cyclic, seasonal – I don’t want to say nightmare – might be too strong – but truly, nothing’s really changed. It’s gotten worse except for the fact that by being involved with the program for so many years, and on the National Advisory Board, and writing so many management plans based on behavioral management, that it has caused a lot of groups to grow. We had four when I started, and that was stretching it. Now we have several hundred groups. There’s a lot more public awareness. There’s a lot more affinity and I think something very deep in people that makes them want to save wild horses because we see a lot of this Lone Ranger-esque type of activity. 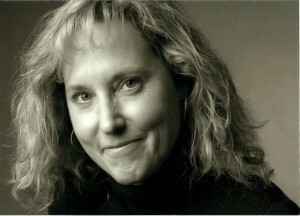 “To me, living out in the field and being able to study wild horses, as well as other wildlife, with no cell phones, no food, no water, no electricity, just living in the field and truly understanding the differences between one horse culture and another at a time before it was influenced a lot by humans – that was a magical time. It will never be brought back again, but it was a magical time. How can mustangs teach us about communicating with domesticated horses? “What’s the real life of horses if they’re given a chance? What’s driving all the stress in our domestic horses, which is coming from their basic instinct to act as natural horses? Sometimes they don’t even know how to act, because they haven’t learned it, because so much of behavior is learned. In answering your question, I think understanding wild horse behavior – it’s not a breed – it’s understanding that horses were native to North America, they evolved into the modern horse over millions of years. Horses have spread and adapted, because of their ability to do social bonding so well, which has allowed them to bond with humans, and try to please us in a domestic world. It is the basis by which I think anyone involved with horses would want to really understand horse culture. You can find some great material provided by contributors to the Inventing Your Horse Career series on the project homepage. Mary Ann is wealth of knowledge, a huge proponent of collaboration and a humble, kind and generous equine professional willing to do what she can for horses and people seeking a partnership. Have questions you’d like Mary Ann to address? Pose them on her website or post them as a comment below and we’ll forward them to her for a personalized response.